Candles are a great way to dress up any table. Uttermost's Winter Trees Brown Metal Candle holder is the perfect centerpiece to decorate your table as the weather gets cooler. 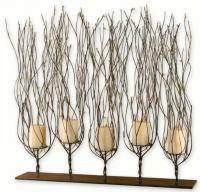 This designer candle holder is styled to resemble winter trees. This striking candle holder will be a stylish accent for your dining room, living room or entryway. For more details visit www.cheapchicdecor.com.